Clin Cancer Res, 2018, 24(1):120-129. Cell, 2018, 173(6):1413-1425. Panobinostat (LBH589) purchased from Selleck. Breast Cancer Res Treat 2012 131, 777-789. Panobinostat (LBH589) purchased from Selleck. Using CRISPR-Cas9 technology, ERα was silenced at the genomic level in ECC1 cells. Ishikawa, parental ECC1 cells and individual ESR1 KO ECC1 clones were treated with 20 nM LBH589 for 24 hr. Expression of ERα, PR, FOXO1, and Myc were evaluated by Western blotting. β-actin serves as a loading control. PLoS One, 2016, 11(2):e0148912.. Panobinostat (LBH589) purchased from Selleck. HDACIs That Simultaneously Inhibit HDACs 1 and 6 Showed Greater Antileukemic Activities than HDACIs that Don’t at Cmax Concentrations. THP-1 cells were treated with LBH-589, PXD101, SAHA, VPA, MS-275 and MGCD0103 at Cmax concentrations for 3 h and 24 h, respectively. The cells post 3 h treatments were washed three times with complete medium and divided into two halves. One half of the cells was resuspended in complete media and cultured for up to 24 h to determine the effects of the 3 h treatments on cell proliferation and apoptosis. The other half of the cells was used to prepare whole cell lysates. Whole cell lysates from the 3 h and 24 h treatments were extracted and subjected to Western blots probed by anti-ac-tubulin or –b-actin antibody (panels A&B), or subjected to HDAC1 enzymatic assays post IP as described in the Materials and Methods (Panels C&D). The effects of the 3 h and 24 h HDACI treatments on cell proliferation, as reflected by percent decrease of live cells relative to untreated cells (panel E), and apoptosis (panel F) were determined by flow cytometry analysis as described in the Materials and Methods. PLoS One 2011 6, e17138. Panobinostat (LBH589) purchased from Selleck. Induction of DNA Damage and Bim Is Critical for HDACI-Induced Apoptosis in Pediatric AML Cells. THP-1 cells were treated with the HDACIs at Cmax concentrations for 3 (panel A) and 24 h (panel B), respectively. Whole cell lysates were extracted and subjected to Western blots probed by anti-p21, -c-Myc, -cH2AX, -Bim, or -b-actin antibody. Cell death induction by LBH589 as a single agent was detected in control or MTDH knockdown Hec50co cells. After 3 days, cell death was determined by the WST-1 method. PLoS One 2011 6, e20920. Panobinostat (LBH589) purchased from Selleck. Expression of pro-/anti-apoptosis genes. Control or MTDH knockdown Hec50co cells were treated for 24 hours with vehicle control, 20 nM LBH589, 25 ng/ml TRAIL or LBH589 and TRAIL at the concentrations noted. Lysates were collected. Expression of DR4, DR5, and apoptosis related caspase-3, caspase-8, PARP-1, BID, FLIP, XIAP, Bim, MCL-1 and BCL-XL was analyzed by Western blotting. 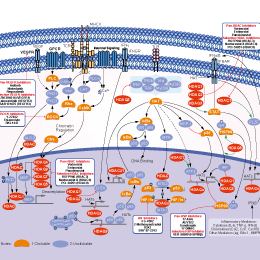 p53(+/+) and (/) HCT116 cells were treated with TSA (1–5 lM),LBH589 (2–5 lM), valproate (2.5–5 mM), MS-275 (20 lM) and sodium butyrate (2 mM). TAp63 expression was compared in both cell lines after 24 h of treatment. Consistent with the above data, all HDAC inhibitors failed to induce significant levels of TAp63 in p53(/) HCT116 cells. Biochem Bioph Res Co 2009 391, 1748-1751. Panobinostat (LBH589) purchased from Selleck. Effect of panobinostat on the viability of cervical cancer cells. HeLa (A) and SiHa (B) cells were treated with increasing concentrations of panobinostat for 24, 48 and 72 h. Cell viability was determined by MTT assay. The results are presented as percentage; calculated from the reduction in cell viability at a given concentration of drug compared to the untreated control (untreated control being 100%). The IC5072h values were calculated from sigmoidal dose-response curves generated in Prism 5.0 (GraphPad). (C) Cytotoxic effects of panobinostat on HeLa and SiHa cells measured at 72 h and expressed as% cell death. Each value is the mean ± SD of three independent experiments performed in triplicates. 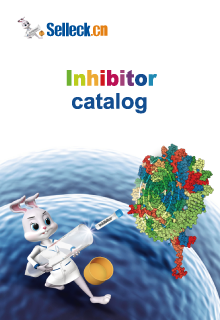 Biomed Pharmacother, 2016, 84:1393-1405. Panobinostat (LBH589) purchased from Selleck. Western blot analysis of Acetyl-H3 and H3. 0-10μM Panobinostat was added. Dr.Zhang of Tianjin Medical University. Panobinostat (LBH589) purchased from Selleck. HDAC inhibitors induce p63a expression (A) HCT116 cells were treated with TSA (1 lM), LBH589 (2 lM), valproate (2.5 mM), MS-275 (20 lM) and sodium butyrate(2 mM) for 24 h. Expression of p63 was assessed by Western blotting with the H129 pan-anti-p63 antibody. Although TSA and LBH589 induced p63 efficiently, valproate, MS-275 and sodium butyrate were much less efficient. The lower panel shows the actin loading control. Arrow indicates TAp63. (B) The HDAC inhibitors used in this study are shown, grouped according to their structure and with their HDAC specificity. The efficiency of TAp63 expression is shown in the last column. Dr. Berna S. Sayan of Leicester University. Panobinostat (LBH589) purchased from Selleck. U266 and KMS-11 were treated with 20 nM panobinostat for 48 h followed by Western blot analysis. Actin served as a loading control. Nine (U266) and 3 (KMS-11) biologically independent experiments were performed. To determine the expression of PPP3CA mRNA in treated cells for 24 h, we performed relative quantification real-time PCR (n = 6). Four (U266) and 2 (KMS-11) biologically independent experiments were performed. JCI Insight, 2016, 1(5):e85061. Panobinostat (LBH589) purchased from Selleck. Scuto A, et al. Blood. 2008, 111(10), 5093-5100. Crisanti MC, et al. Mol Cancer Ther. 2009, 8(8), 2221-2231. Ocio EM, et al. Haematologica, 2010, 95(5), 794-803. Maiso P, et al. Cancer Res, 2006, 66(11), 5781-5789. Atadja P, Cancer Lett, 2009, 280(2), 233-241. How to reconstitute the compound for in vivo mice study? We recommend the vehicle is 2 % DMSO, 2 % Tween 80, 48%PEG300, 48% water. The compound is first dissolved in DMSO, then add Tween, PEG300, water in sequence. Vorinostat (SAHA, MK0683) : Approved by FDA for cutaneous T cell lymphoma.